Aiku Lal’s days begin at 5 in the morning. The 44-year-old slips out of bed, looks in on his sleeping son, Akbar, 14, goes out to clean his tea stall, barely 200m down the lane from their home, and prepares breakfast. At 6.30am, Akbar joins him and they share a quiet meal together. Father and son then make their way to Mumtaz Degree College, where Akbar is a student in class VII. The routine has not varied for seven years now—ever since the winter evening when Lal found a lost and lonely Akbar, sobbing on the lawns of Safed Baradari in Lucknow’s Qaiserbagh complex. Lal took in Akbar as a son and they have not lived apart since. But that could change if the boy’s birth mother, who has approached the Supreme Court, wins back custody. Akbar was 7 when he got lost in Allahabad in 2004. His biological father had taken him along to his drinking hole and as he proceeded to drink, the boy wandered off. Days later, Lal found him weeping a few feet away from his stall outside the Baradari lawns in Lucknow. The child had no idea how he had come more than 200km from home. Lal took Akbar to the police, but since his parents had not registered any missing complaint, they could not trace his family till his mother Shahnaz Begum surfaced in 2007 to claim her son. So far, Akbar has refused to leave his “papa". “My mother never looked for me once I got lost. She suddenly came after several years when I am happy," he says. Lal grew up working in tea stalls and getting some basic lessons in Hindi and Urdu from a kindly Communist, M.M. Sharma. “I used to spend my days at a tea stall serving tea and during the night I would learn Hindi and Urdu from Sharmaji. I have forgotten all that was taught to me. The only thing I remember is the ratio of tea leaves to sugar to be put in boiling water. But this will not be my son’s fate," says Lal. Determined to script a different fate for Akbar, he has arranged for extra tuition classes for ₹ 100 a month. “He is weak in math and science. I decided to get him to repeat class VII. 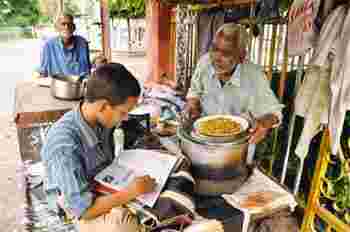 He had cleared his exams but with poor marks," says Lal, who has started selling pulao to augment his income. He earns a little more than ₹ 100 a day, but ensures that he sets aside ₹ 10 as Akbar’s daily pocket money. “So what if Akbar’s father is a street vendor, he can still provide well for his son," Lal says. In the by-lanes of the Qaiserbagh neighbourhood, their heartwarming tale is well-known, thanks to the court case and media attention. Neighbours and strangers proudly point out the odd pair as they go about their business. “Aiku Lal could have made Akbar help him at the shop. Instead, he makes sure that Akbar goes to school and studies well," says Mohammed Hasan, who runs a small shop opposite Lal’s. The pair at their tea stall outside Safed Baradari, where Lal found the boy. On 10 August this year, a Supreme Court bench of Justices D.K. Jain and H.L. Dattu remarked that a mother is a child’s natural guardian but asked, “Why would we order the boy, who has now spent seven years under the good care of the person, be given back to the mother disregarding the child’s wish?" The bench added, “Let the child attain majority and himself decide the question." However, the apex court has also asked for details of Shahnaz’s income to ascertain if she can support Akbar since she, as a widow, is also raising two daughters by herself. Her counsel has argued that there have been instances of children being kidnapped and suggested that the court order a meeting of Shahnaz, Akbar and Lal with psychiatrists and representatives of a child welfare society to evaluate the situation. Shahnaz has not filed any reply on income with the court till now, says Arjun Harkauli, who is the advocate for Lal in the Supreme Court. Till the Supreme Court pronounces its final verdict, Lal and Akbar live in constant fear of separation. “I fear Shahnaz will take him away forcibly. She has already attempted it once. Three months ago, she came here with armed men but my neighbours called the police and saved us. The policemen later assured me no one can take my son away unless the court orders," says Lal. He doesn’t like to leave Akbar unaccompanied for too long. He walks the boy to school every morning, leaving his tea stall to be looked after by a neighbour. He is back at the school gates every afternoon, waiting to take Akbar home. He has taught Akbar to be wary of strangers, and warned him against eating anything outside the house. “If he wants to eat a simple boiled egg, I make it. If he wants to eat a complicated mutton (dish), I cook it," says Lal, a vegetarian, who has made it a point to learn how to make Akbar’s favourite dishes. “I can’t pinpoint the day or the month when Akbar became my son. But once I realized our relationship, I decided not to marry. A Hindu wife might object to mothering a Muslim child. I would not let anyone come between us or separate us." As the festive season rolls in, father and son are content that they have each other to celebrate the festivals with: Akbar got a set of new clothes for Eid; for Diwali, his “papa" has promised him a bagful of crackers.